Blacksmithing technically started around 1000 BC with the advent of the Iron Age, but the techniques of the craft have been developing over a much longer period of man’s history, We have no way of knowing for sure how our ancient ancestors made the transition from working with stone to smelting and casting tools of copper. We do know it happened a very long time ago. Otzi, the famous Iceman found frozen in the Italian Alps, is believed to be around 9,000 years old and was carrying a beautifully fashioned copper axe in his equipment. Experiments in reproducing this axe showed that it had been cast as molten copper, then refined by hammering before being abraded into a cutting edge. At some point around 3000 BC, man learned that by adding arsenic and later, tin to the copper during the molten stage, he could produce bronze which was far superior to copper in hardness and durability. For the next 3000 years of man’s history, all the weapons and tools of civilization were made of bronze. 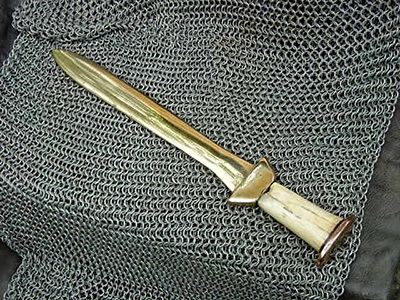 Many of the methods used to fashion items of bronze translated into working iron. The Hittites of the Turkish Peninsula began to smelt iron ore around 1000 BC. Iron had the advantage of being able to be heated and hammered into shape without first being cast into a mold. It also had more strength and was less brittle than bronze. The iron wheels of chariots wore longer. The iron arrowheads and spear heads could be reshaped and used for longer periods of time. The original iron though was somewhat soft, and long swords of iron had a tendency to bend. Fortunately, men learned to incorporate carbon into the iron to increase its strength and its ability to hold an edge. This created steel which formed the building blocks of our modern age.